The trend today is towards Business Intelligence and Customer Relationship Management (CRM) and I think we have all realised that for any capable web marketer, the three vital statistics are: the KPI (Key performance Indicator), ROI (Return on Investment) and Web Analytics. So, let’s dive into the (customer) Marketing adventure, a field which can be applied to most sales contexts including the online, which don’t differ much from a more traditional ‘Brick and Mortar’ situation. Who is a company’s good customer? He/she is firstly loyal, and always returns to the company for a purchase to the point of being ready to talk others into becoming clients. This type of client is called a company advocate. The aim of any customer relationship manager is to make people clients and then to turn them into loyal clients. To get them on the road to becoming perfect clients, there are different stages that the company needs to lead them through. This stage consists in becoming “visible” to potential clients (Prospects). The methods used here are largely standard advertising techniques (TV, press, mailing lists, Phishing, posters, billboards, emailing and general online Buzz). At this stage there is no measurement of the impact since the publicity is ‘blind’ and its success can only be measured at the purchasing stage. Don’t forget that attracting attention is a means of opening up new markets as well as making a Brand known. Note that I separate the marketing from the purchasing stage. This is standard procedure in “classic” marketing ( seeing an ad for soap powder on TV doesn’t mean a trip to the store follows) this separation is less frequently made with online business because of the absence of the distance factor (when we see an ad online, purchasing opportunities are just a clic away). Once you are known to your Prospects your aim should be to get them to buy from you. You now have to work at getting them involved in the purchasing stage. From social psychology studies, we now know that this stage is essential in getting the buyer to acquire interactive habits you want them to keep (isn’t a non-consenting buyer a victim of fraud?). Online, buying should be interactive and a Prospect who becomes a client should have: clicked on your banner, taken part in a promotional game or answered your email etc. 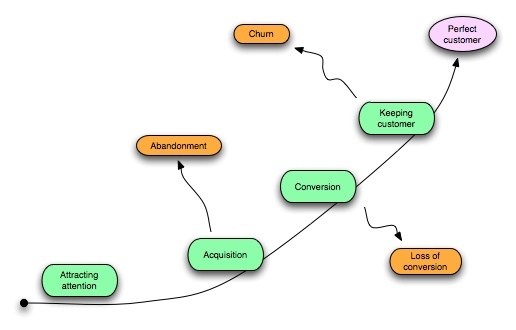 At this stage of your customer relationship a simple measurement called Cost of Acquisition (CA) is used. CA is lowest when the entire ‘target’ from the previous stage responds asking for more information. 1. The first is technical – not having a user-friendly website, slow response to or loss of emails etc. 2. The second reason is linked to the virtual aspect of the situation which makes it easier for the buyer to opt out. Let me explain. The acquisition stage ends when the conversion stage starts and, online, this means the moment you pay for what you have chosen to buy. In real life this is different, nobody likes to abandon a caddy full of shopping in the aisles of a supermarket because pushing it around for a couple of hours has meant deliberate physical involvement and makes the decision to leave it there very difficult. Once you have a prospect you must keep him/her. You could ask why not start the process all over again? Well that’s because, more often than not, it is cheaper to secure customer loyalty. Moreover, the number of potential clients isn’t infinite and a client who leaves because of mishandling, rarely returns. It is important therefore to set up marketing strategies aimed at keeping customers and ultimately increasing their conversion rates. This stage is made up of a series of quality controls that are carefully managed. At this stage, we now have perfect clients (if all goes well), and several interesting measurements can be used over a given period.